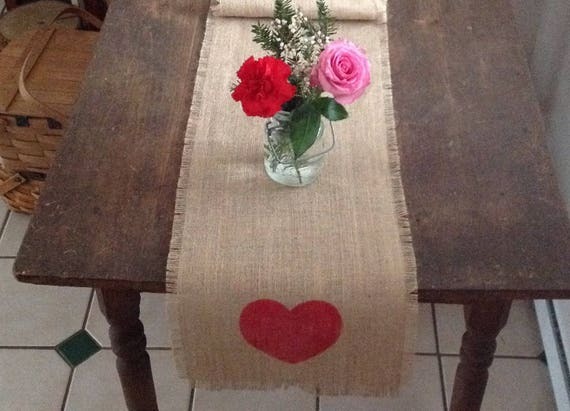 This burlap and lace table runner is a special decoration for your home!! Size: 55x14inches. Can be made in a variety of custom sizes. Variety of burlap, lace and felt color options. Size: 61×13 inches. Can be made in a variety of custom sizes. Size: 55×14 inches. 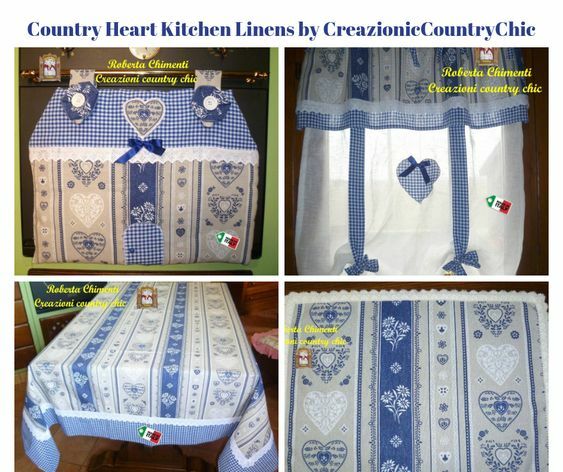 Can be made in a variety of custom sizes. 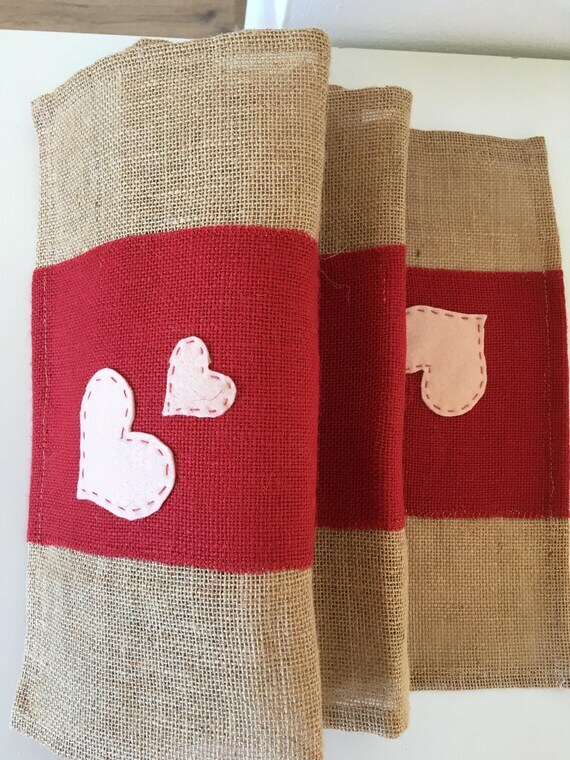 Variety of burlap and lace color options. 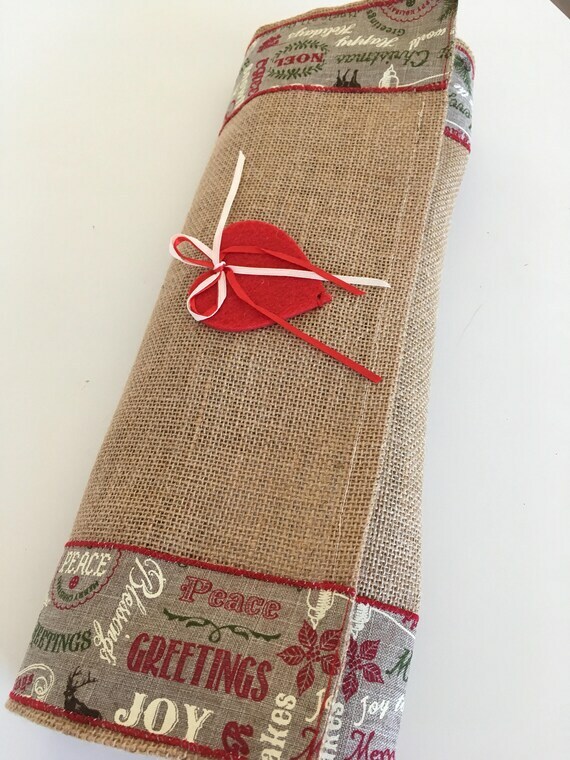 This burlap and lace table runner is perfect for your home or your special events!! Size: 14×54 inches. Can be made in a variety of custom sizes. 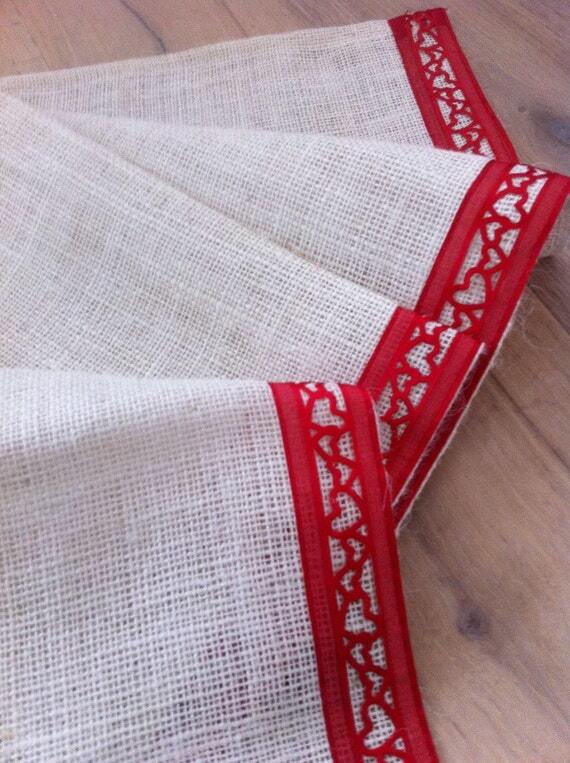 XL – Södahl – Vintage tabel runner with hearts – Made in Denmark. XL – Vintage Christmas table runner from Danish Södahl – Made in Denmark. 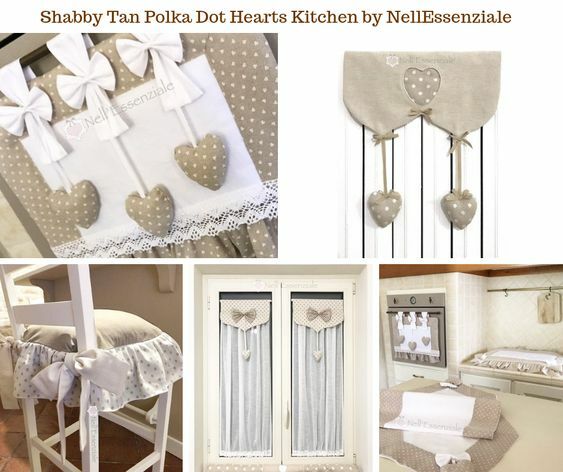 Made with Christmas hearts – and in dark brown – orange – and gold colors – typical Södahl. In Excellent vintage condition. 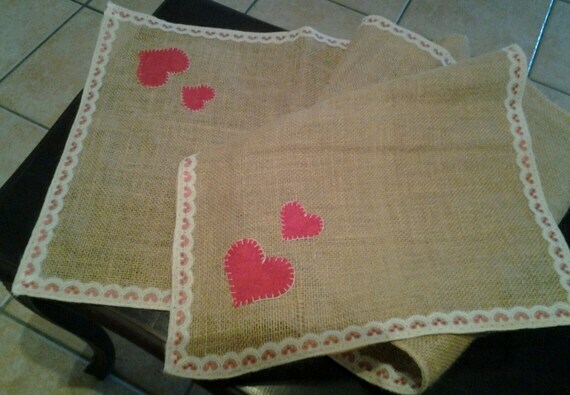 Made in hessian / Burlap. Size: 14×38 inches. 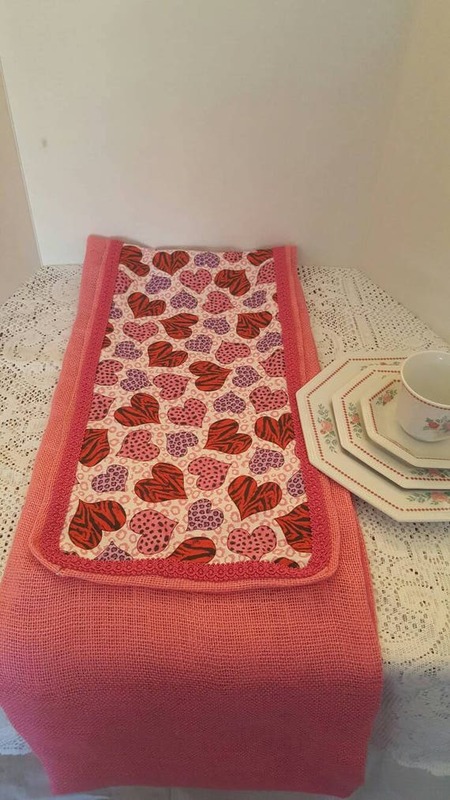 Can be made in a variety of custom sizes. Size: 15×54 inches. Can be made in a variety of custom sizes. 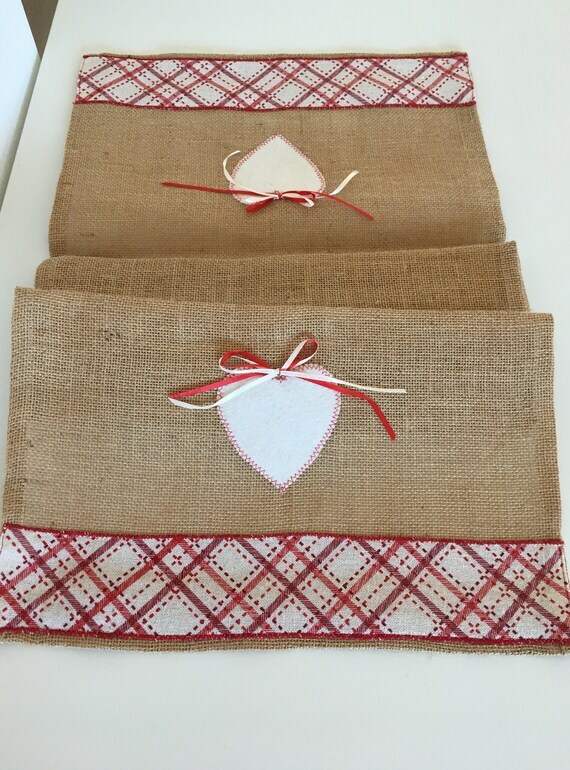 This Red Heart table runner is made of premium natural burlap. 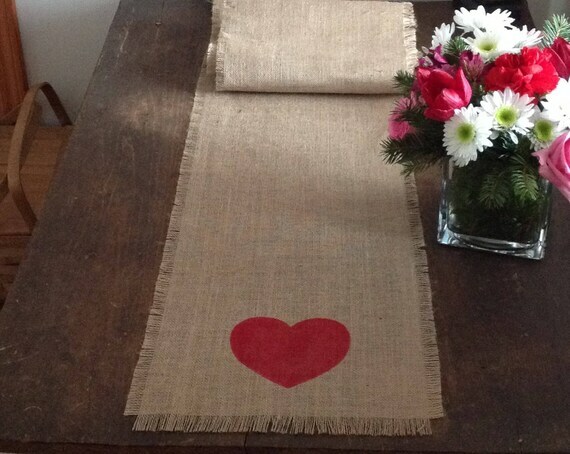 This burlap runner is hand-painted and comes in sizes shown above. All edges have been frayed and stitched to prevent further fraying. 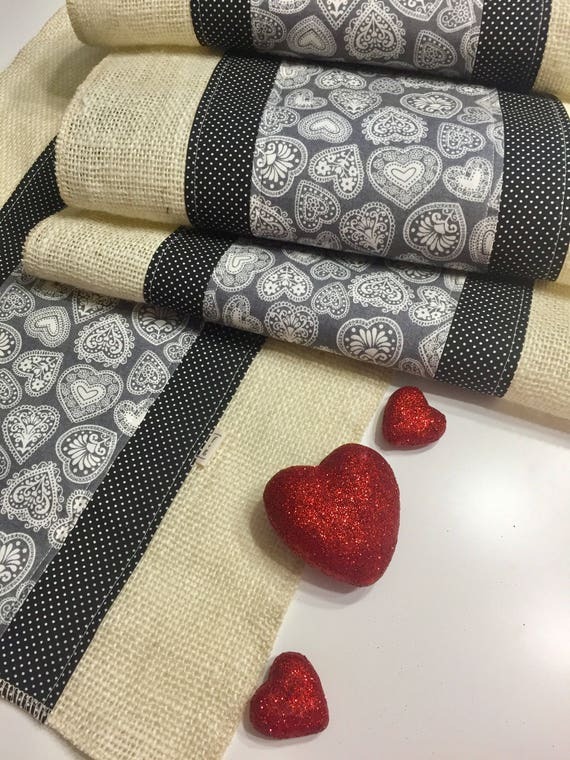 Rustic cream burlap and cotton table runner in a valentine’s themed vintage heart print with coordinating black fabric with white dots for decorating your table during the holiday season. 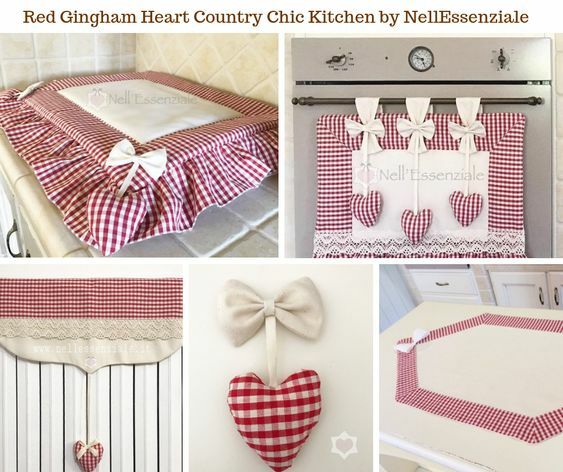 Perfect for dining room table or larger kitchen table. Makes a great gift for that someone special! 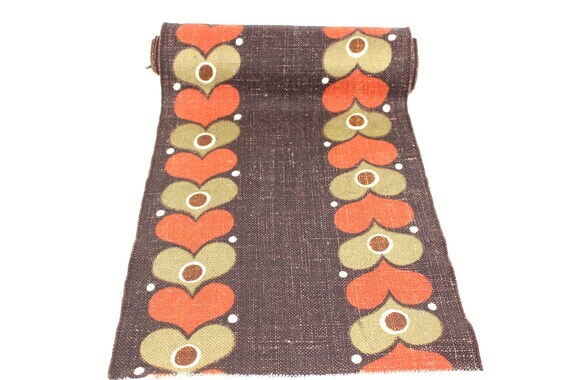 This burlap runner is hand-painted and comes in sizes shown above. All edges have been frayed and stitched to prevent further fraying. Single Heart is painted at both ends. 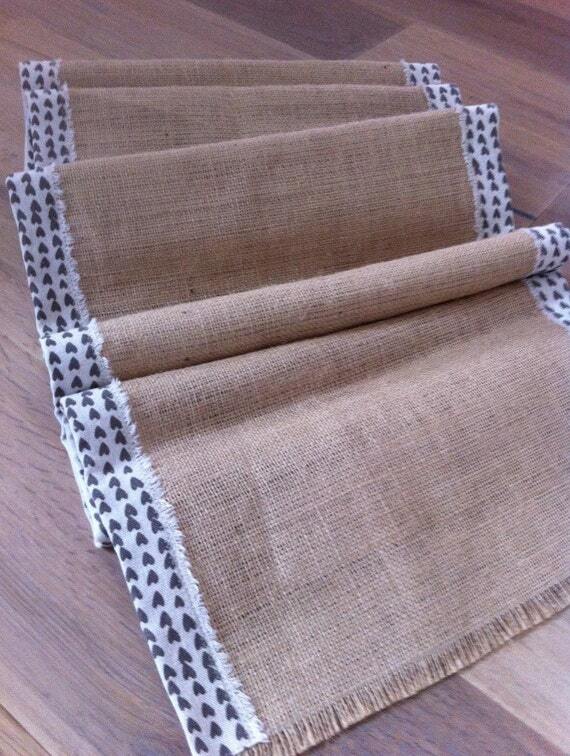 This burlap and lace table runner is a special decoration for your wedding!! Size: 60×13 inches. Can be made in a variety of custom sizes. 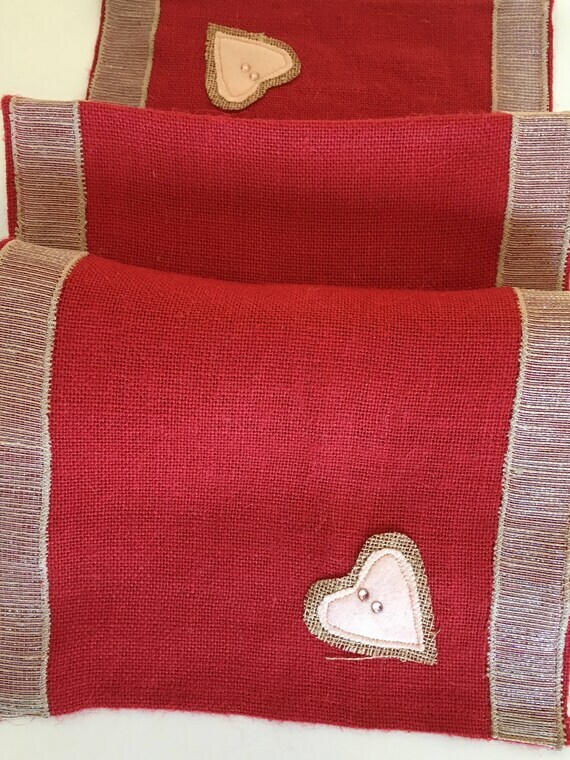 Variety of burlap and lace colour options. 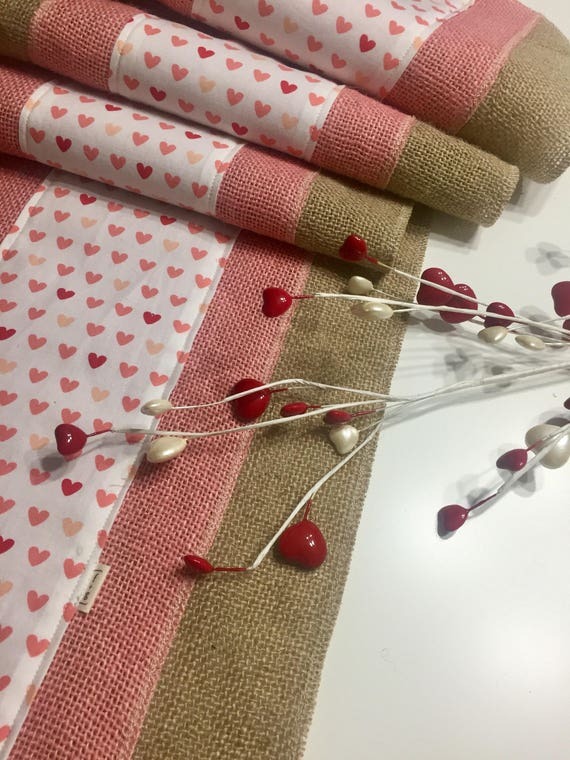 Rustic natural burlap with pink burlap overlay and coordinating cotton fabric featuring a Valentine’s heart print for decorating your table during the holiday season. 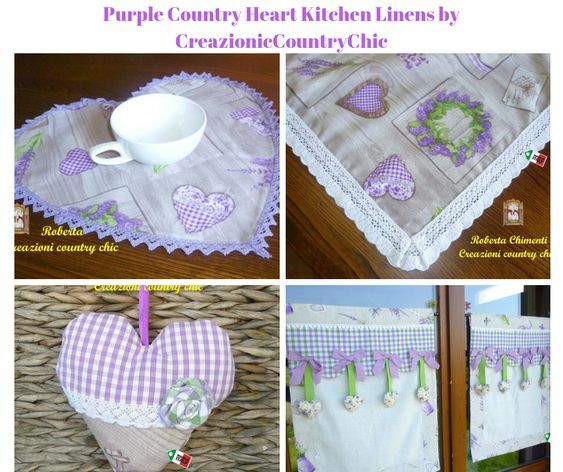 Perfect for dining room table or larger kitchen table. 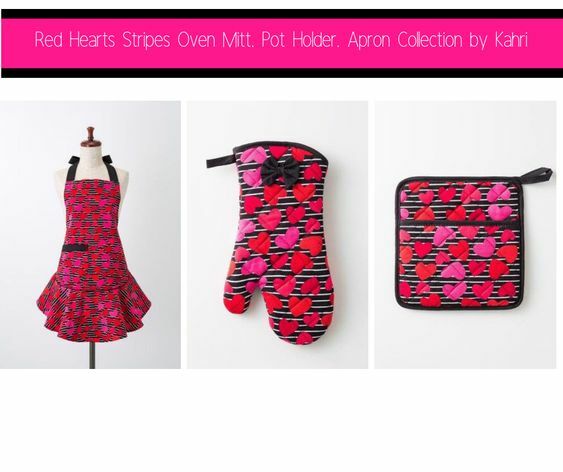 Makes a great gift for that someone special! 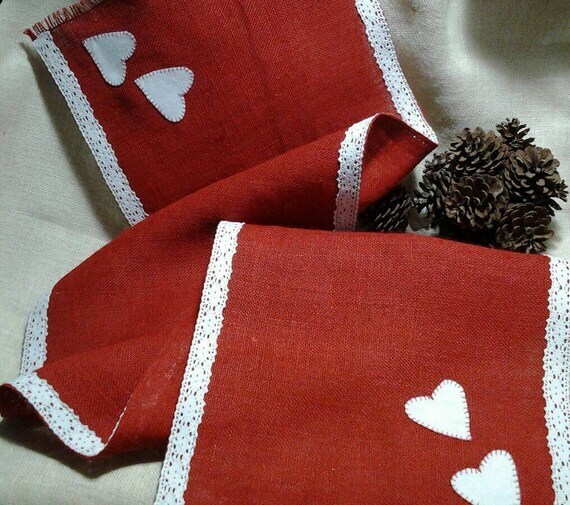 Embroidered Hearts Table Runner (72″ long) on each end of slightly off-white fabric. Gorgeous for the Wedding Cake Table, Bridal Book Table, Sign-in table, Grooms Cake table, Bridal Shower, Party Décor, etc. Decorating is endless…use at the Wedding & then display on your dining table after the wedding! Very elegant slightly off-white fabric. Perfect area in center for Wedding Cake, sign-in book, Wedding book, flower bouquet, etc. 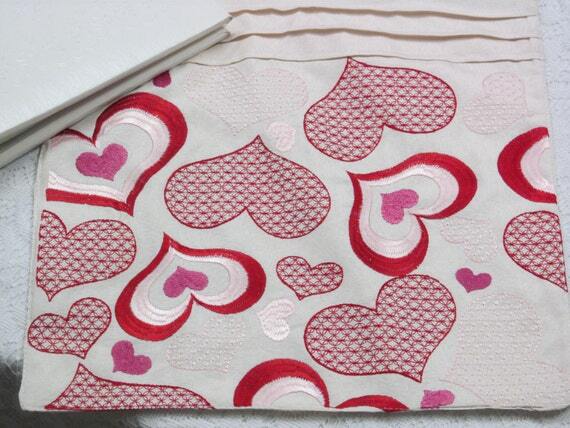 This item is a 100% Valentines heart fabric that sits on a pink burlap material. 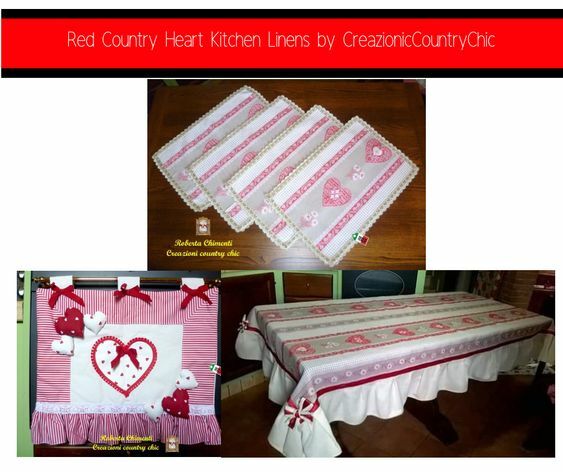 This festive table runner’s backing is a rose colored 100% cotton fabric and will add a touch of class to your home decor. 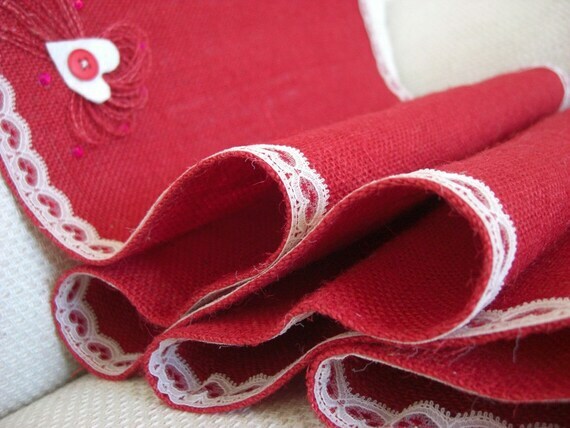 The Valentines fabric is lined with a rose colored trimmings. The ends are squared and the runner is double stitched for strength and durability.